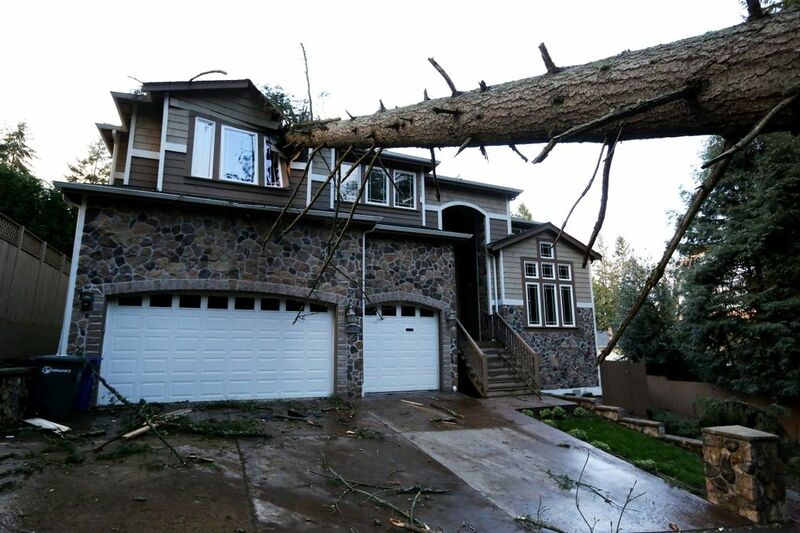 High winds have killed one person in Seattle and tens of thousands are without power throughout Western Washington. 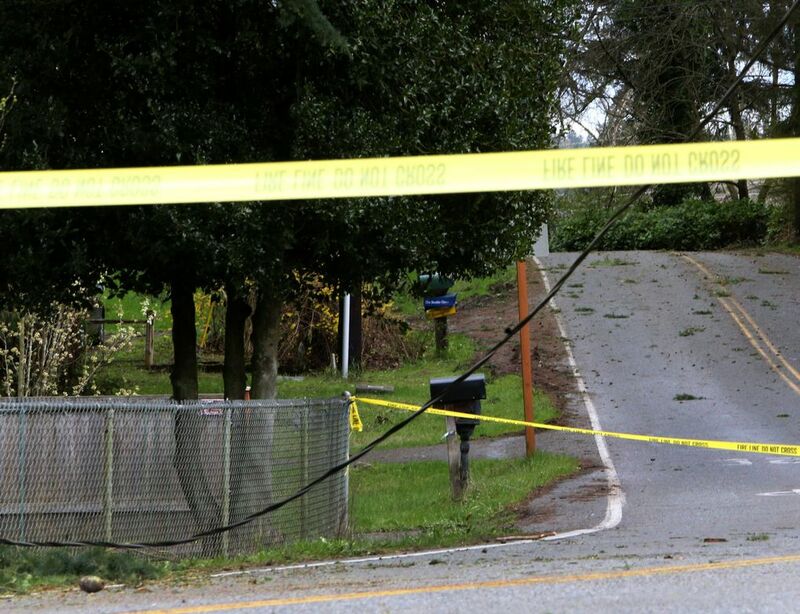 The King County Medical Examiner has identified the man who died in Sunday’s windstorm. Eric Medalle, 42, was in the driver’s seat of a vehicle in Seattle’s Seward Park when an evergreen tree collapsed onto the vehicle and killed him, according to the medical examiner. Component post 9946551 could not be found. More than 50,000 customers remain without power — 41,190 served by Puget Sound Energy and 9,484 served by Seattle City Light, according to outage maps posted by those agencies. Crews managed to reopen the Highway 520 bridge overnight. 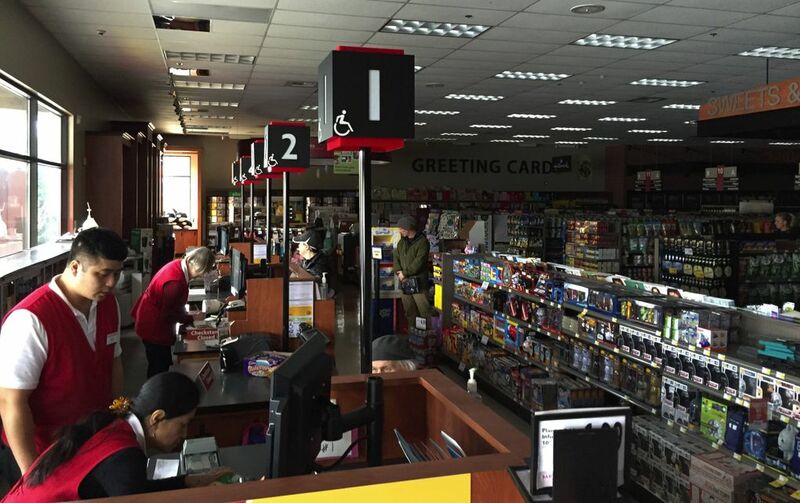 See this post for Monday updates on power outages, school closures and more. 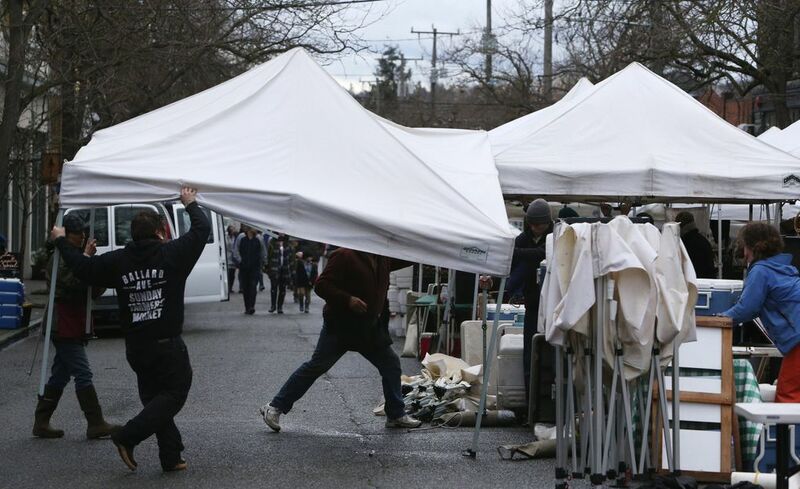 Savage gusts battered Western Washington on Sunday, dropping trees, shuttering major highways and knocking out power to hundreds of thousands of people. 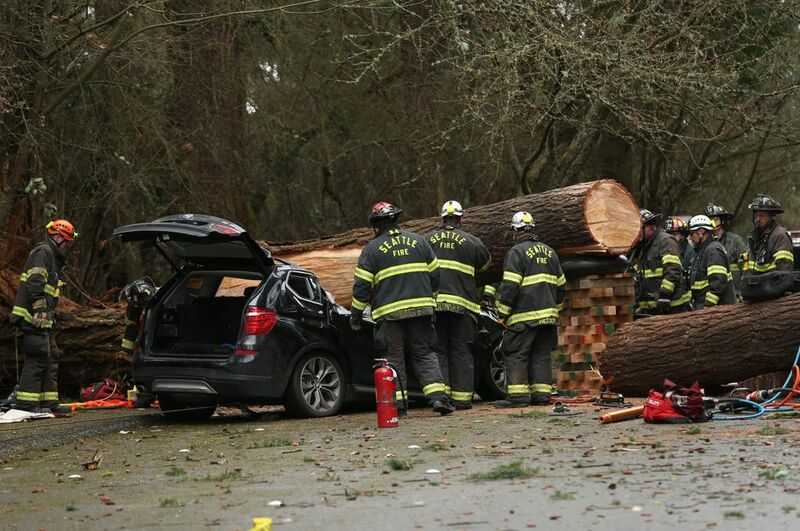 The windstorm, punctuated by fierce downpours, spawned widespread damage and killed at least one man in a sport-utility vehicle — crushed by a wind-snapped tree in Seattle’s Seward Park. A passer-by plucked a toddler girl from the crumpled BMW, delivering her to emergency crews responding to 911 calls shortly before 2 p.m. The girl, taken to Harborview Medical Center, suffered only minor injuries, a Seattle Fire Department official said. “It’s good that the little girl was able to get out, but unfortunately it’s a sad story,” said Seattle Fire Department spokeswoman Corey Orvold, as fire crews worked nearby to remove the man’s body from the half-crushed vehicle. 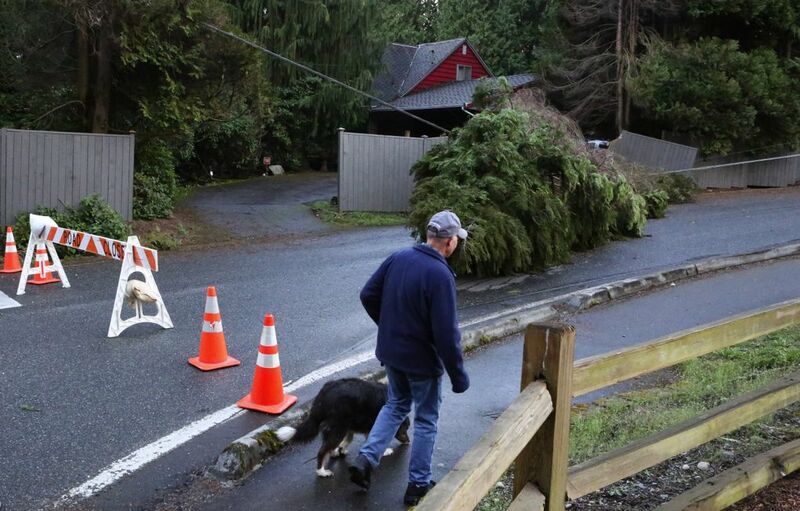 Elsewhere, powerful winds toppled trees into homes in Lakewood, Bothell and West Seattle and downed power lines across the region, with gusts whipping more than 50 mph. Major roadways — including the Highway 520 floating bridge and part of Interstate 405 — were shut down amid the raging winds. 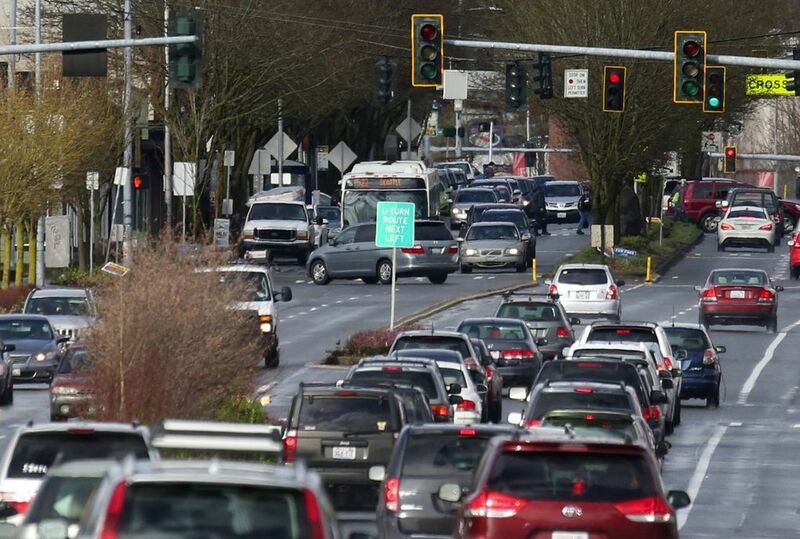 In all, more than 200,000 customers lost power Sunday afternoon, with widespread outages striking West Seattle, Beacon Hill, Snohomish County and Shoreline. By 7 p.m., more than 39,000 households in Seattle and more than 168,000 customers in 10 Western Washington counties remained without power, officials reported. 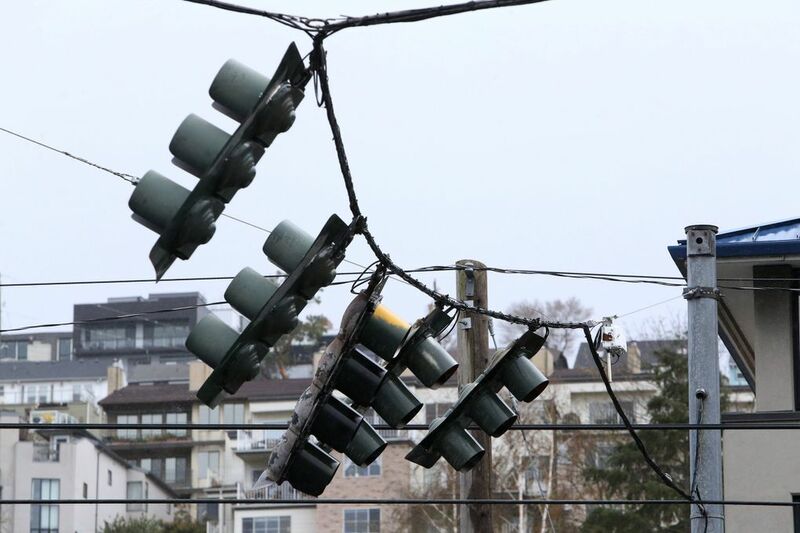 It could take two days to fully restore power to all customers, Puget Sound Energy spokeswoman Christina Donegan said. 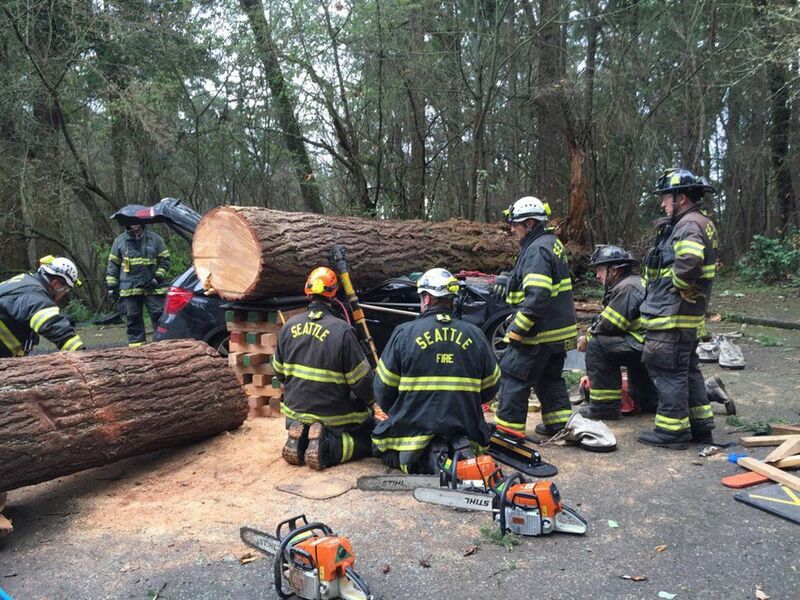 The storm’s only known fatality Sunday died about 1:37 p.m. when a massive evergreen next to the road that loops through Seward Park snapped near the base of its trunk. The tree collapsed across the road and onto the front half of a black BMW X3 with the man in the driver’s seat. Fire officials initially believed the victim was a woman. Only after firefighters sawed through the tree and removed chunks of it from the crumpled SUV, then cut through the vehicle to extricate the body, did they realize the victim was a man, Orvold said. Emergency officials cordoned off a section of the park road while crews toiled to free the man’s body Sunday afternoon. Beyond the police lines, a collapsible stroller could be seen in the back of the half-crushed SUV. City fire and utilities crews worked more than two hours at the grim scene, even while towering evergreens in the woods around them teetered and groaned amid the sporadic gusts. Some of Seattle’s oldest trees are contained within the 277-acre Seward Park. The tree that killed the motorist stood next to a field that harbors the park’s outdoor amphitheater. Sunday’s fierce winds closed major roads all around the region. 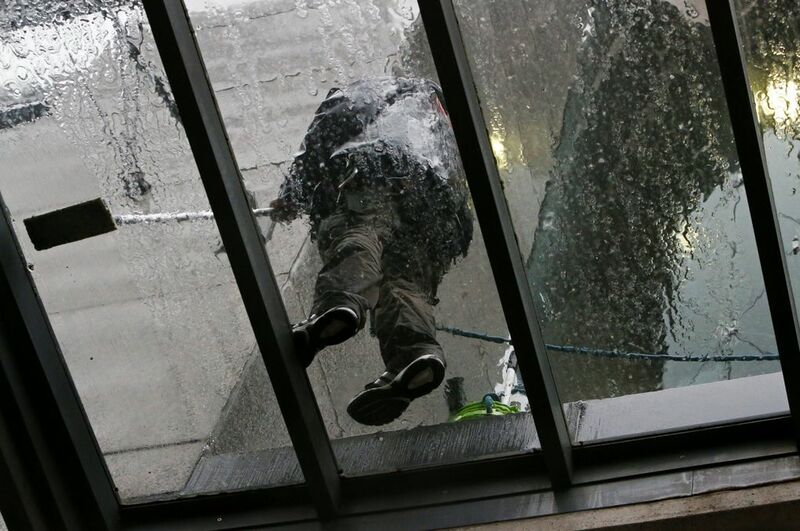 Powerful cross-gusts whipped up white caps on Lake Washington between Seattle and the Eastside, showering water onto the 520 bridge and causing state transportation officials to shut the span in both directions for the first time in two years. Maintenance crews later discovered damage to part of the mechanical system that allows the draw span to move up and down. Severe wind likely contributed to that damage, state transportation officials announced late Sunday. The bridge was expected to remain closed overnight for repairs and to be opened “in time for the morning commute,” WSDOT said in a statement. The windstorm also shuttered the Hood Canal Bridge and toppled a semi-truck on the Tacoma Narrows Bridge, temporarily halting eastbound traffic. In North Seattle, police closed a five-block stretch of Aurora Avenue North to keep cars away from a dangling power line at North 93rd Street after winds blew a power pole off balance. Downed trees blocked two lanes of traffic on southbound Interstate 405 in Snohomish County, backing up traffic for miles. A debris slide that blocked rail tracks south of Mukilteo forced Amtrak and Sound Transit to suspend rail service between Seattle and Everett, and Washington State Ferries canceled or delayed several routes. Puget Sound Energy had warned customers Friday of the coming “March Madness” storm, issuing a high- wind warning. PSE also cautioned that trees and branches weakened by rain could damage power lines. The National Weather Service clocked gusts of nearly 50 mph near Boeing Field on Sunday afternoon, and tracked a 76 mph gust near Moclips on the coast. 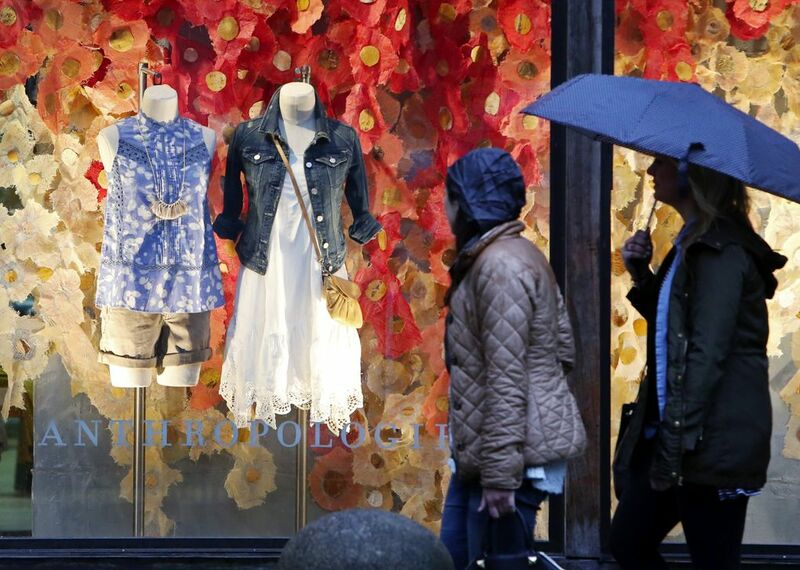 The furious winds struck about 1 p.m., accompanied by localized downpours. 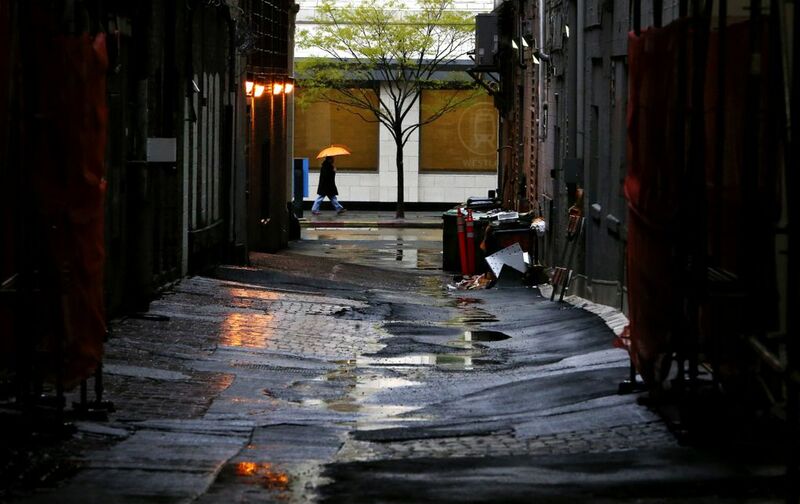 “We’re not so concerned about the rain as we are the wind,” weather-service meteorologist Jay Neher said Sunday. The storms peaked earlier than expected and had mostly eased up by late afternoon or early evening. Even after the worst of the storm had passed, officials warned that wind-soaked grounds posed problems for trees. 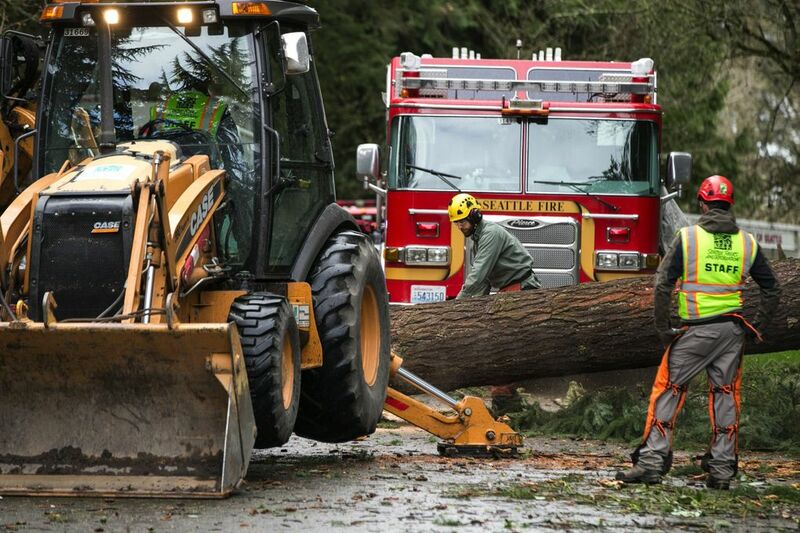 Seattle City Light spokesman Greg St. Peter said early Sunday afternoon that trees likely would keep falling through the evening. He encouraged people to “hunker down” at home and use caution with generators. “I think a lot of trees are going to keep coming down,” St. Peter said. Throughout the region, downed power lines sparked fires, and the gusts even caused structural damage to a building in Lynnwood, officials reported. Firefighters stood back from a blaze near Lake City Way and Ravenna Avenue Northeast. The fire popped and hissed as rain hit it, alternately sparking and dying down as the power line hummed with electricity. Francisco Marquez, who works for a landscaping company, was toiling in the driving rain after being called in on his day off to saw up and truck away a 30-foot-tall tree knocked into the parking lot of the Taco Bell restaurant on Aurora Avenue North at North 90th Street on Sunday afternoon. “There’s been too much rain recently, making the roots soft, and now we have the wind,” Marquez said. Lewis Kamb: lkamb@seattletimes.com; on Twitter @lewiskamb; Rachel Lerman: rlerman@seattletimes.com; on Twitter @rachelerman; Daniel Beekman: dbeekman@seattletimes.com; on Twitter @DBeekman.